Something a bit different to share with you today! But don't worry - non-nail beauty items won't become the norm for me. I just think it's nice to mix it up from time to time, don't you? :) I'll have some extra awesome nail art to share with you tomorrow so if you're not interested in this I'll see you then! 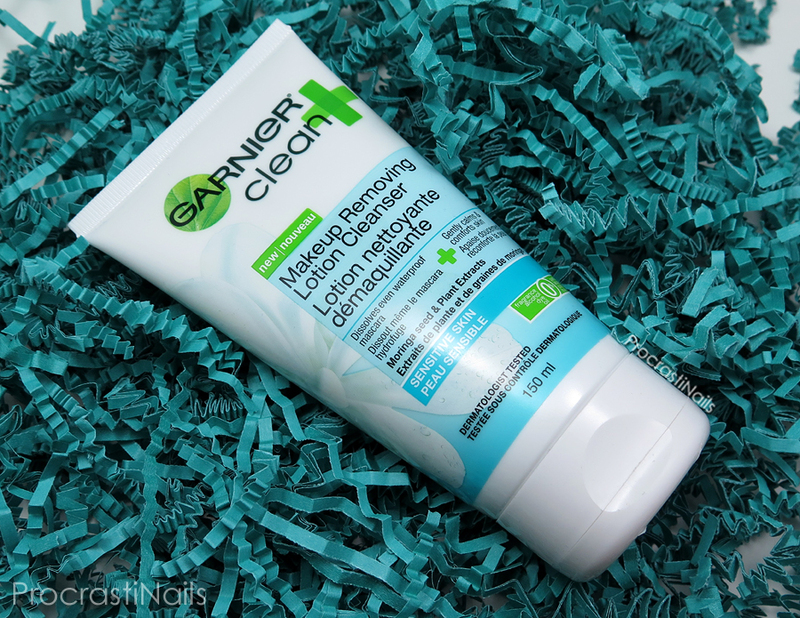 Today I'm taking a look at the new Garnier+ Makeup Removing Lotion Cleanser. It both removes makeup and moisturizes and is quick enough for even the laziest skin care person (*cough* like me) to add to their routine. Let's start with the basics. I am a nail person for a reason - makeup and me don't jive. I know my basics and I wear gel eyeliner and mascara every day, but that's usually it. My skin is also really sensitive to dyes and fragrances. In terms of skin care I usually wash my face with a cleansing oil in the morning and night, and then sometimes I wear a night mask to bed. I moisturize whenever I remember to (which isn't nearly as often as it should be). That's it. Am I sometimes too lazy to properly take off my makeup at night before bed? Abso-freaking-lutely. So I tried it. I tried it for 3 days, morning and night, removing it with water in the evening and removing it with a cotton ball in the mornings (so it could also act as a bit of a moisturizer for lazy me). And honestly, I plan to continue using it! I was impressed with how my skin felt, and it was honestly so so easy to add to my routine. You smooth it on and wipe it off and you're good to go. Even when I wasn't wearing makeup I used it because it still pulled a lot of oil and dirt from my skin after a long day. As you can see it completely removed the purple eyeliner but there's still a hint of the black one left. Still, overall it worked really well! I don't own any other lotions or removers that would work this well. The one concern is that I had to rub quite firmly to get the cleanser to do its job - maybe a bit harder than I'd like to around my eyes. Pros: It cleaned and moisturized well both with and without makeup, didn't need much to get the job done, was really quick and easy to use, completely unscented, didn't impact my allergies at all so I didn't react to it, removed my liquid eyeliners almost completely. Cons: I broke out a little when I first started using it, and I had to rub quite firmly to get my liquid eyeliner off. Does this look like a product you would use? Have you tried it already? I'd love to hear what you think! * Product has been provided by Garnier Canada, the opinions and language are my own, and in no way do they reflect Garnier Canada. It removed makeup pretty good. Might be something for me to check out once I've used up some of my cleansers. It really did, I was quite happy with it. :) You should check it out! Firstly, I love that main photo that you had taken of the product. Absolutely beautiful. I really enjoyed this product as well. I didn't expect much from it to be honest.Happy with the results though! I noticed you said you used a washcloth in the evening and cotton pad in the morning. Do you prefer one over the other? I only used a washcloth when I used mine so I'm interested in knowing if there is any sort of difference! I know you do mostly nail stuff but, I have to say, I really think this is a great review and I hope you do more beauty posts in the future! Yeah I was thinking to myself that it'd probably be more beneficial to the skin to NOT use a damp wash cloth.. just because they say that it's supposed to make your skin look healthier after a weeks use. I don't know how well that would work when wiping the product off with the wash cloth. I'll have to try the cotton pad method this week!